A key strategic goal of the City Council is to proactively prepare underutilized properties for redevelopment. This comprehensive rezoning proposal, along with The Palace of Auburn Hills redevelopment study and rezoning and the rezoning of the Oakland County Animal Shelter Property are excellent examples of the City Council, Planning Commission, and staff working together with private landowners to implement that vision. In recent years, the City has participated in conversations with representatives from Oakland Community College and WMU-Cooley Law School regarding the re-use of their underutilized property located along Featherstone Road. Due to significant demand for high-tech land in Auburn Hills that could accommodate corporate headquarters and R&D facilities, it was agreed by all parties that it would be prudent to conduct this rezoning. 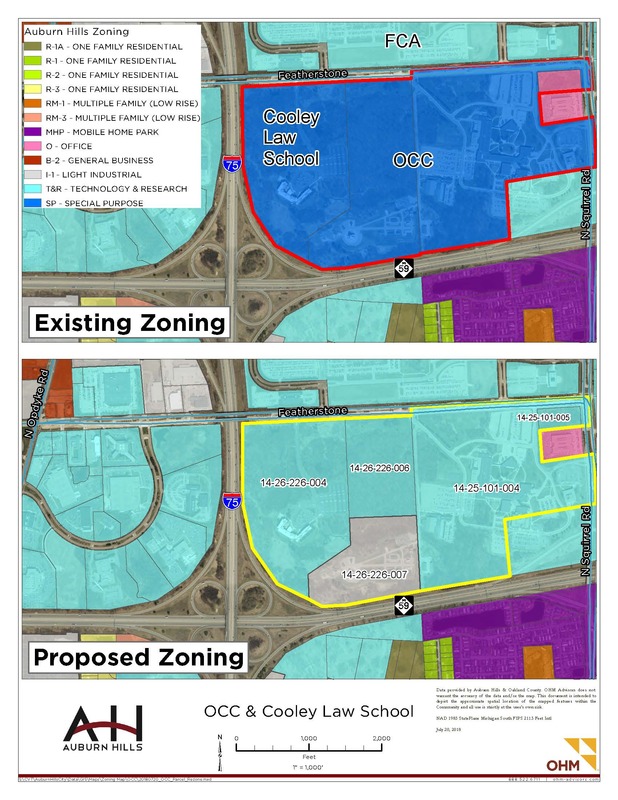 The rezoning will allow additional land use flexibility in the redevelopment of the property, if so desired by Oakland Community College and WMU-Cooley Law School in the future. New development would place the underutilized portions of these tax exempt properties on the assessing rolls, which will generate new property tax revenue and jobs. The WMU-Cooley Law School property located at 2630 Featherstone Road (Sidwell No. 14-26-226-004) is proposed to be rezoned from SP, Special Purpose District to T&R, Technology and Research District. The Oakland Community College property located at 2900 Featherstone Road (Sidwell Nos. 14-26-226-006, 14-26-226-007, 14-25-101-005, and 14-25-101-004) is proposed to be rezoned from SP, Special Purpose District and O, Office District to T&R, Technology and Research District and I-1, Light Industrial District. Lastly, it is noted that the rezoning will also facilitate the State permitting and construction of a digital billboard sign, previously approved by the City Council in January 2016, on Oakland Community College’s CREST Center property adjacent to M-59. Those interested in learning more about this proposal are encouraged to attend the Planning Commission meeting scheduled for Wednesday, August 15th Wednesday, September 12th at 7:00 p.m. in the Council Chamber at City Hall. A final decision on the application is anticipated to be made by the City Council on Monday, August 27th Monday, September 24th.